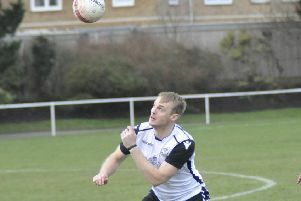 Jack Shonk hit a brilliant hat-trick as Bexhill United beat Billingshurst 7-2 in the first round of the Sussex Senior Cup. Billingshurst took the lead before Zak McEniry equalised on 29 minutes. Shonk scored his first from the penalty spot after he was bundled in the box. That made it 2-1 at half-time. Shonk made it 3-1 on 49 minutes before Jack McLean made it 41 two minutes later. Shonk completed his hat-trick on 54 minutes. Sammy Bunn had the chance to make it 6-1 from the spot, but he missed the penalty. However on 75 minutes Shonk made it 6-1 with his fourth of the evening. Billingshurst then pulled one back before McLean finished off the scoring. Other results from the Sussex Senior Cup: AFC Uckfield Town 1, Steyning Town 0; East Preston 1, Peacehaven 0; Hailsham Town 4, Wick 1; Midhurst and Easebourne 0, Horsham YMCA 6-0; Eastbourne United 4, Worthing United 3; Billingshurst 2, Bexhill United 7; Selsey 2, Arundel 1; Eastbourne Town 3, Sidlesham Town 0.